Ansonia Clock Co. "Crystal Palace No. 1 Extra", C. 1880. 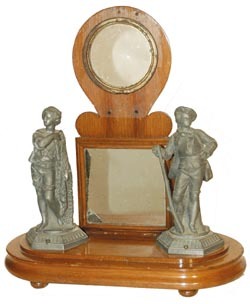 Very nice walnut base and back, correct feet, correct lower mirror, (top mirror added), Hunter and Fisher statues. Ly-Ansonia, page 95.